Did you know that oxygen has a role to play in your oral health? No, getting a breath of fresh air isn’t enough to kill harmful microbes in your mouth. But there’s a super-charged form of oxygen that helps eliminate bacteria, fungi, viruses – even parasites – that can create disease and dysfunction. That highly reactive form of oxygen is called ozone. Yes, the same gas that protects you from harmful ultraviolet ray levels is a powerful disinfectant! Infections cannot survive when they encounter ozone’s volatile, reactionary nature, which makes it perfect for the minimally-invasive treatment of gum and bone infection. Not only does ozone therapy clear out the infection; it promotes better blood flow, enhanced immune response and quickens healing. Ozone therapy helps us neutralize an area before filling a cavity or undergoing cosmetic surgery, thus reducing the chance that an infection will start. It has also shown great success in cleaning the gap left by a tooth that needed to be pulled. Another study published that same year likewise found ozone effective. Gaseous ozone demonstrated a strong antimicrobial effect on cariogenic bacteria in both in vitro and ex vivo conditions and it can be used as an adjuvant in caries therapy. Most importantly, ozone therapy helps you heal more quickly with less pain. This was nicely demonstrated in a study published about a year ago in the International Journal of Oral and Maxillofacial Surgery. Sixty subjects had their wisdom teeth removed. One extraction site was treated with ozone and the other with “sham ozone therapy.” Overall, participants reported less pain on the treated side, as well as using fewer painkillers. A healthier mouth and better healing those times when dental work is needed? Who wouldn’t want that? Does a Ozone injection have to be done one tooth at a time? I have to have a deep cleaning done can it be used then? 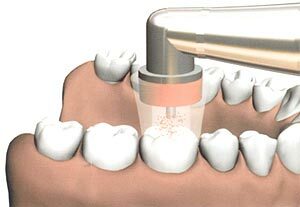 Ozone can be injected directly to the tooth or administered with trays to irrigate the gums. And yes, the procedures can be done as part of a hygiene appointment.